Naturalis supplements range is a selection of complementary vitamins and minerals favoring the proper functioning of the body when included in the daily diet. Their role is to support a healthy and balanced diet, ensuring the proper functioning of the body and, implicitly, a greater resistance to diseases. 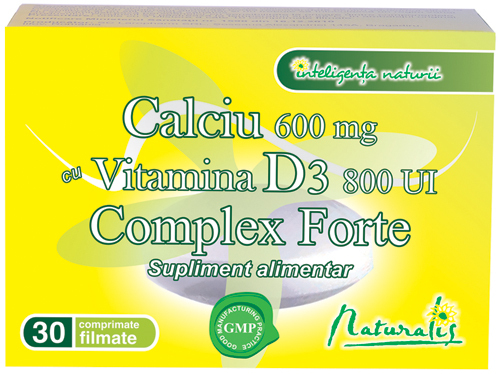 Naturalis Calciu D3 Forte a dietary supplement with calcium and vitamin D3 that provides the optimum amount of calcium both for adults and children. • Helps the treatment of insomnia. • Supports the proper functioning of thyroid, parathyroid and pituitary gland. Naturalis Cardioforte is a dietary supplement for people at high risk of developing cardiovascular diseases. 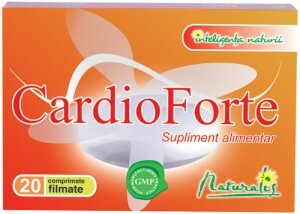 This supplement contains common hawthorn extract and magnesium, ingredients that favor the normal functioning of the heart. Common hawthorn (Crataegus monogyna) is used since ancient times in the treatment of heart and liver diseases, as a remedy for insomnia, as well as in treating multiple energy imbalances. Clinical trials reveal that common hawthorn extract has a positive influence over coronary circulation, improves oxygen and nutrients transport, ensuring the proper function of the heart muscle. Magnesium is an essential nutrient and a cofactor for over 300 enzymes involved in biosynthesis processes. Magnesium ions help the body’s energy metabolism. Naturalis Cardiosuport contains essential nutrients and natural substances with a positive impact on the cardiovascular system. 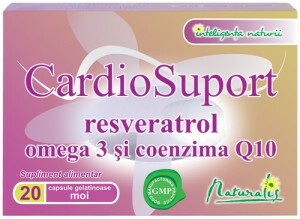 Resveratrol is an antioxidant substance that slows cellular aging and one of the substances responsible for the “French paradox”: though French people lead sedentary lives and opt for diets rich in animal fats, because of the habitual consumption of resveratrol-rich red wine, they have a low cardiovascular risk. This substance protects the vascular endothelium from the negative impact of cholesterol and triglycerides, limits the activity of proinflammatory factors and has a positive influence over adipocyte metabolism. 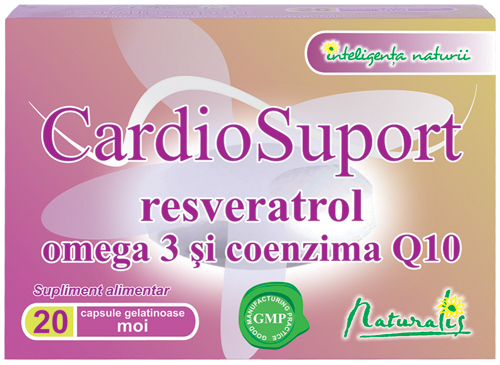 Besides resveratrol, Naturalis Cardiosuport contains EPA and DHA fatty acids which favor blood pressure normalization, and Coenzyme Q10 with antioxidant properties that ensure optimal protection against free radicals. 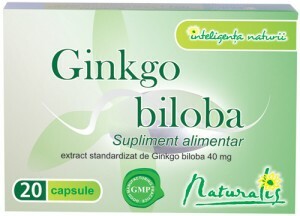 Naturalis Gingko Biloba increases intellectual capacity, improves memory, attention and focus. Taken 1 to 3 times a day, it prevents exhaustion and lack of energy, increasing the tonus and physical efficiency of the body. Since it’s a powerful antioxidant, ginkgo biloba strengthens capillary walls and protects brain cells against aggression. It also improves cerebral blood flow; and a well oxygenated brain entails the improvement of memory and cognitive functions. 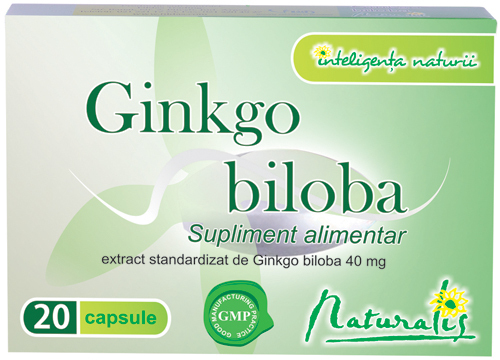 Naturalis Gingko Biloba can be used as a preventive measure and potential treatment in Alzheimer’s disease and dementia; it was demonstrated that some patients with Alzheimer’s or dementia symptoms showed a positive response to gingko biloba treatment, their cognitive function improving visibly. Ginkgo biloba reduces as well the frequency and duration of depression episodes. 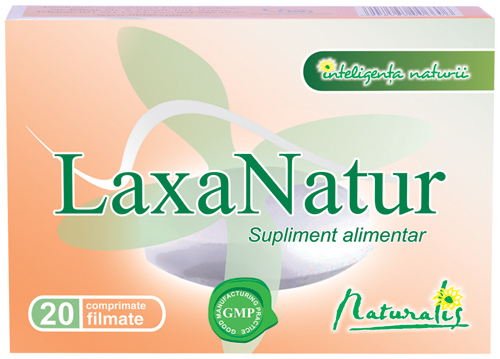 Naturalis Laxanatur is a dietary supplement that alleviates chronic and acute constipation, stimulates intestinal transit and maintains the tonicity of the digestive tract. A fast-paced life, unhealthy diet habits and stress are some of the factors contributing to the unbalance of the digestive system which triggers a slow digestion and a general feeling of discomfort. Naturalis Laxanatur is a concentrated formula with Senna extract. Senna is a strong purgative, used in treating constipation; it acts by stimulating a bowel movement. Senna extract in Naturalis Laxanatur is a natural means of alleviating functional disorders of the digestive tract. Naturalis Laxanatur has a pleasant orange flavor. Omega-3 fatty acids decrease the risk of heart attacks and offer protection against sudden death during myocardial infarction. Furthermore, they can prevent arthritis, diabetes and some psychiatric disorders through their ability to control the basic functions of the cells. • Favor the proper development of the body and preserve its health. 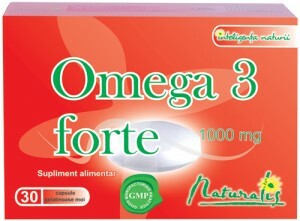 Omega-3 fatty acids contribute to the development of the fetus brain. They are responsible for the proper growth of brain and sensory cells. Later on, these fatty acids continue to play an important role in the good functioning of the brain, increasing cognitive ability. 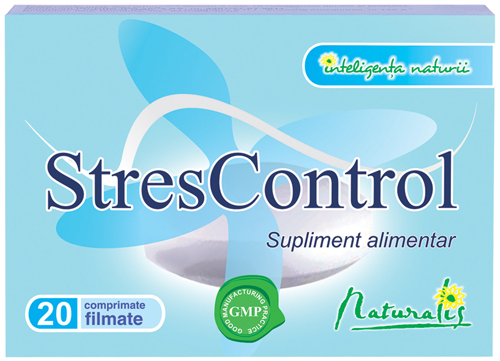 Naturalis Strescontrol is a dietary supplement with a formula based on valerian extract, perforate St John’s-wort extract, magnesium and vitamin B6, ingredients with beneficial effects on emotional states and on body’s capacity to adapt to stress. Valerian is a medicinal plant used as remedy against insomnia and anxiety. Perforate St John’s-wort extract has beneficial effects on affective disorders triggered by stress, premenstrual syndrome, menopause, seasonal affective disorders. Magnesium maintains muscular and nervous functions, keeps cardiac rhythm within normal limits and favors skeletal system health. Vitamin B6 reduces fatigue, exhaustion and keeps the normal functioning of the affective and cognitive functions. Vitamin D3 is crucial for the human body since it is involved in calcium and phosphorus absorption, two of the most important minerals in skeletal health. Vitamin D3 helps maintaining the strength of the immune system, preventing osteoporosis, rickets in children (and it is mandatory for newborns, especially if they are breastfed) and cancer. Since diet does not provide sufficient amounts of vitamin D3 and the body secretes it solely by sun exposure (10-15 minutes a day), Naturalis Vitamina D3 Forte is a precious ally, ensuring the proper daily dose of vitamin D3. 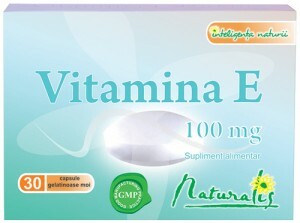 A vitamin D3 supplement is recommended especially for people who do not get enough sun exposure, for elderly people who have trouble assimilating vitamin D3, for people with certain diseases (Crohn disease, cystic fibrosis, coeliac disease) and for obese people, since large fat deposits reduce the levels of the active form of vitamin D.
Vitamin E supplements have a positive impact over blood cells, fighting against free radicals. By means of an antioxidant process, vitamin E prevents the development of cardiovascular diseases, protecting heart and arteries, it prevents diabetes, cataract, as well as several types of cancer. Vitamin E restores the membranes of blood cells attacked by free radicals, while protecting healthy cells against the harmful effects of free radicals. 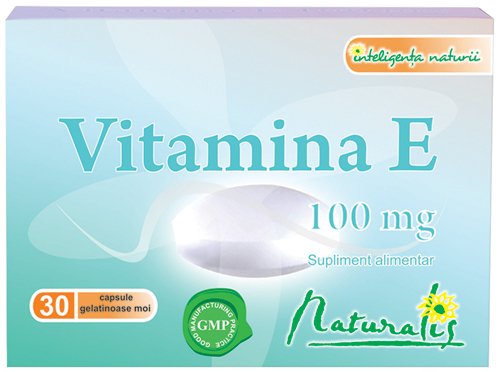 Vitamin E enables the proper functioning of the reproductive system and endocrine glands. It increases immunity as well. It is recommended in treating gynecological diseases, such as dysmenorrhea, menopausal disorders, ovarian and uterine atrophy, sterility. The skin is also protected by the action of vitamin E against serious burns or wounds, scarring triggered by various eczema, acne, psoriasis, etc. • Has a tonic effect on the entire body. Indications: An inadequate dietary intake of vitamin C, an increase in the amount the body needs or in case of excessive elimination of vitamin C. Administered regularly, vitamin C can effectively prevent diseases from simple colds to various viral infections. Indications: In case of an unbalanced diet, strenuous exercise, stress, diuretics, when using birth control pills, and to relieve the effects of premenstrual syndrome. A combination with beneficial effects on bone, hair, skin and nails health. 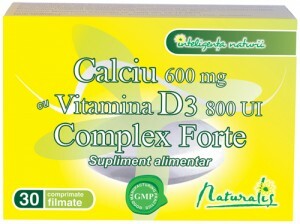 Naturalis Calciu cu vitamina D regulates muscle function, ensures a better functioning of the heart. For children, Naturalis Calciu cu Vitamina D promotes the proper growth. Bone mass decreases from the age of 25, both in women and men. For women, the risk increases significantly after menopause because estrogen production ceases and the process of calcium absorption in bones is impaired. 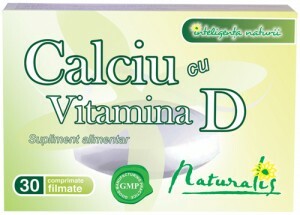 In order to be assimilated, calcium requires mainly vitamin D, magnesium and vitamin C.
It can be introduced as a dietary supplement regardless of age, even in children, to build a solid bone mass to protect against further demineralization and subsequent fracture risk that increases with age. An ideal combination of elements essential for the proper functioning of the human body. Designed to support the body’s health affected by daily stress, environmental pollutants, a busy lifestyle, physical and mental overwork. 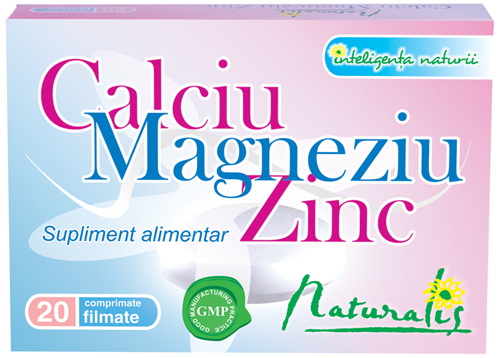 Acting together, the three elements – calcium, magnesium and zinc − maintain the health of the nervous, circulatory, muscular and bone systems. • In increasing the immunity of the body, in sustained physical and mental stress. It enables the normal functioning of the prostate. 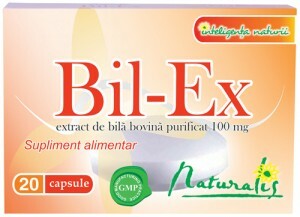 Naturalis Bil-Ex stimulates bile production, stimulates and facilitates digestion. 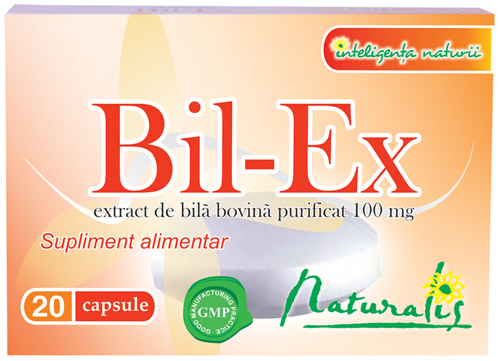 Naturalis Bil-Ex improves emulsification and resorption of lipids and of fat-soluble vitamins and increases the activity of lipase (enzyme involved in the digestion of fats). Digestive disorders: colitis, enterocolitis, dyspepsia, malabsorption, indigestion, abdominal discomfort, nausea, bloating, constipation. 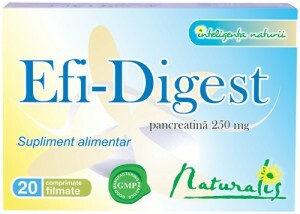 Naturalis Efi-Digest improves digestion and relieves quickly the abdominal discomfort after a meal. The extract is similar to human pancreatic secretion, secreted by the liver, administered to ensure the proper level of pancreatic secretion in enzyme deficiency situations. 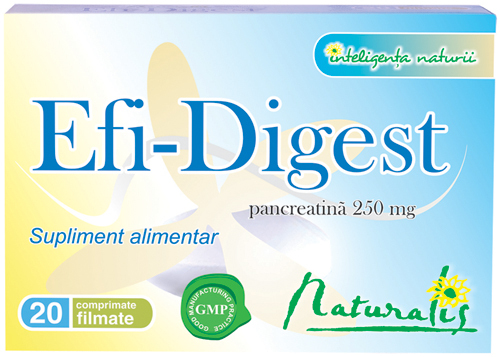 It is recommended to sedentary people and to people with digestive problems. It is helpful in digesting excess food rich in protein and fat.